Simply.Write is a free Windows 8 Text Editor app that lets you create, open, edit, and save text documents. With this free Windows 8 Text Editor app, you will get a distraction-free writing environment, so that you can focus all your attention on creating quality text documents. You can also share these text documents with others via e-mail using the Windows 8 Share charm. This free Windows 8 Text Editor is a simple tool without much of the formatting options that you usually get in a text editor application. So, all you get is a pure writing pad to put down your thoughts. You can also select an output folder destination and save the text documents on your system. The Settings option lets you adjust font size of the document and Text area’s Width, thus making it convenient to read a text document. Simply.Write is freely available in Productivity category of Windows Store. You can view the app directly in Windows Store by clicking on the link given below at the end. 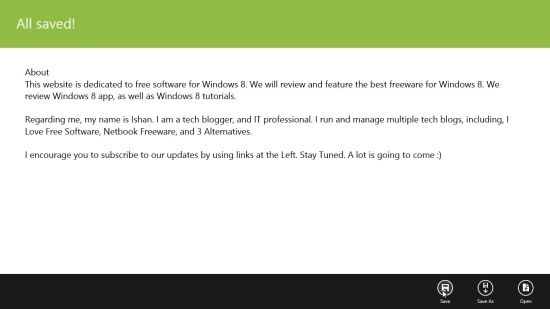 Let’s have a quick look at this free Windows 8 Text Editor app. As I mentioned, it is a minimalistic Text Editor app simply dedicated to provide you with a distraction-free writing environment. Therefore, you will find the main screen of the app like a blank paper, entirely free from any formatting features. As you right click on the screen, the app bar will appear displaying options Save, Save As, and Open. To create a text document, simply click on the app’s screen and start typing. You can save this document in a desired folder on your system. To do so, click on Save As, select an output folder destination, give a name to your document and click on Save button. The Save option in the app lets you temporarily save the document that you are working on. You can click on Save option and close the app. The app will regenerate this document when you open the app again. You can also use Open option to open a text document in the app, read it, and make simple editing. The Settings option that appears from the Settings charm will enable you to adjust font size and text area’s width. You can drag the sliders provided to adjust font size and text area’s width a as per your convenience. Checkout some other feature-rich Windows 8 text editor apps we reviewed earlier: ModernNote, ELECOM Text Editor. Simply.Write is a simple Text Editor that provides you a distraction-free writing environment. Try this app to create and share your text documents. Do let us know what do you feel via comments.